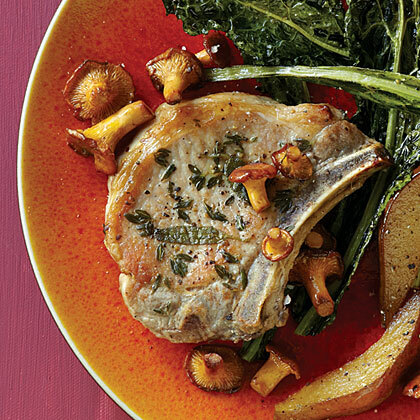 For this recipe, look for the prettiest, most curvaceous bone-in pork chops you can find, rather than the hefty squarish kind. Serve the chops with and . Season chops all over with salt and pepper, then sprinkle with thyme and sage. Heat oil in a large nonstick frying pan over medium heat. Add chops and cook 5 minutes, or until nicely browned underneath. Turn chops over and pour in Calvados; cook until liquid evaporates, 2 to 3 minutes. Reduce heat to medium low, cover pan, and cook 6 minutes, or until chops are barely pink in the center (cut to test). Transfer chops to a warm plate, tent with foil, and let rest 5 minutes. Add mushrooms to pan and cook in pork juices 2 to 3 minutes, or until tender.